This is a 1" Billet Aluminum Plenum Spacer for a 1986 or 1987 Buick Grand National, T Type, Turbo T, or GNX 3.8 liter turbo V6. Allows more room to use a 4" inlet pipe to your turbo. May interfere with hood liner clearance. 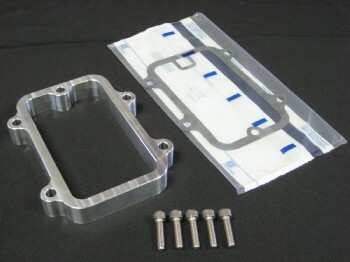 Includes gaskets and attaching hardware. This is a "BILLET ALUMINUM CNC MACHINED 1" THROTTLE BODY SPACER TAPPED" for a 1986 or 1987 Buick Grand National, T Type, Turbo T, or GNX 3.8 liter turbo V6. 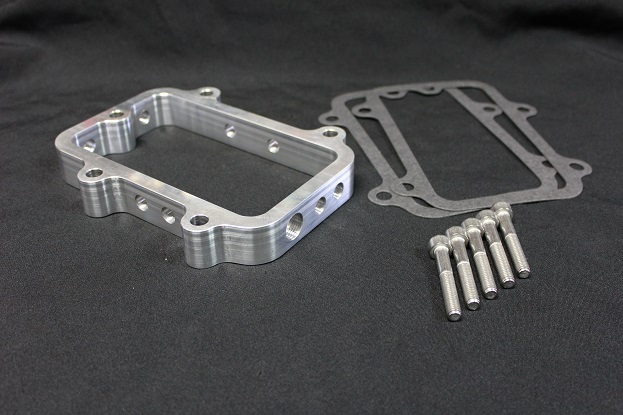 This 1" Billet aluminum spacer is designed to adapt with the factory intake manifold. This spacer also features drilled and tapped holes, this allows the user to utilize the ports and bypass a vacuum block on the manifold. Also, this spacer features a provision for the Air Temp Sensor to be inserted in the spacer. Bolts and 2 gaskets are included. *** Barb fittings or plugs are not included. The ports are open as shown and the customer is to supply the barbs and caps where needed.